Programme Borodin's Quartet No. 2 in Da major; Shostakovich’s Quartet No. 8 in C minor, opus 110; Tchaikovsky's Quartet No. 1 in D major ,Opus 11, "Accordion"
The Borodin quartet was formed in 1945 and was originally called The Moscow Philharmonic Quartet. 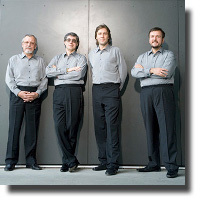 The named changed to the Borodin Quartet ten years later. This group is a regular feature of the Friends of Chamber Music Series, and I always feel that I'm in very exalted company when I hear them. That they were founded so long ago also gives one a sense of history. The members of the quartet have changed over the years. The newest member is the cellist, Vladimir Balshin, who joined the group in 2007 following the retirement of Valentin Berlinsky, whose career spanned more than six decades. The concert began with the second of Borodin's two quartets, written when the composer was in his late 40's. Borodin was primarily a physician and chemist, and only began to study composition at around age 30, when he was already a professor of chemistry. The quartet strongly features the cello, especially in the sweetly melodic and well-known slow movement. The Shostakovich quartet was the emotional centre of the concert. This piece was written during a visit to Dresden in 1960, which brought back Shostakovich's own wartime memories. It has been described as his War Requiem, and is the only quartet by Shostakovich with programmatic content. The quartet is also a sort of musical signature, being based on a four-note motive (D - E flat - C - B) which is derived from Shostakovich's name. It was first played in private by the original Borodin quartet for the composer himself, who is said to have wept after the performance. The quartet is extraordinarily powerful, depicting brutality, chaos, and, through a recurring melancholy cadence on an empty chord with no third for hope or comfort, utter desolation. The piece was played with great mastery throughout, but I was particularly impressed by the purity of blend the four players achieved on this recurring, empty chord. The effect was such that at the end of the piece we experienced one of those magic moments where audience and performers alike are so spellbound by the music that has just been played that all sit in a collective silence for a while before the spell breaks and the clapping begins. The concert ended with Tchaikovsky's amiable first string quartet, something of a dessert to the Shostakovich main course. It had in common with the Borodin piece the key of D major, and also a beautifully songful, famous, slow movement. But while the finale of Borodin's quartet never quite seems to take flight, Tchaikovsky's brought the evening to a rousing and effective close.